Published Oct 25, 2013 by Addison-Wesley Professional. Part of the LiveLessons series. Experts in most domains perform quite differently than beginners. For example, professional athletes, musicians, and dancers move fluidly and effortlessly, without focusing on each individual movement. Likewise, when master software developers write code, they approach it differently than novices, drawing on years of design experience to help guide their solutions. When watching experts perform, it's often easy to forget how much effort they put into reaching these high levels of achievement. Continuous practice, repetition, and mentoring from other experts are crucial to their success. At the heart of all these activities is knowledge and mastery of patterns, which are reusable solutions to common problems that arise within particular contexts. In this lesson you learn to recognize the importance of design experience when becoming a master software developer. You also learn what patterns are and how they help codify design experience to improve software quality and developer productivity. In addition, you learn the common characteristics of patterns and pattern descriptions. Finally, you learn about the history of the Gang of Four book and its patterns, as well as learn about key types of relationships among patterns. While it’s certainly possible to discuss patterns in the abstract, good design and programming practices are not best learned through generalities and platitudes. Instead, it’s more effective to see how significant programs can be made easier to write and read, easier to maintain and modify, and more efficient and robust via the application of time-proven software patterns. 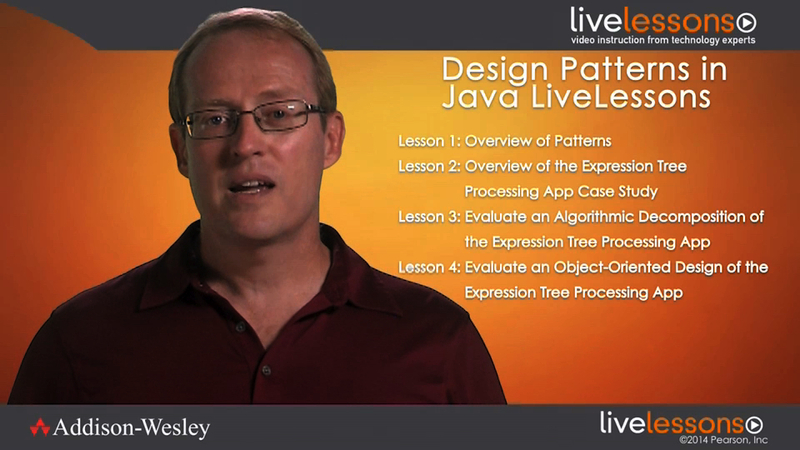 This lesson therefore presents an overview of an expression tree processing app that we use as a case study throughout the course. You learn about the goals of this case study, which provides a realistic–yet tractable–context in which to explore the why, the how, and the benefits and limitations of applying many Gang of Four design patterns to an application written in Java. Using the case study as a guide, you also learn how to recognize key structural and behavioral properties in a domain, as well as understand the case study's functional and non-functional requirements. All the pattern-oriented software presented in the case study is available in open-source form from the course website. You can see throughout the course that applying Gang of Four patterns in the case study not only improves the application’s modularity, extensibility, and quality but also enhances its portability so that it runs on a range of Java platforms, including Android and Eclipse. Algorithmic decomposition is a historically popular software development method that structures software based on the actions performed by algorithms in a program. It decomposes general actions in an algorithm iteratively and recursively into more specific actions. The design components in an algorithmic decomposition typically correspond to processing steps in an execution sequence, which are usually implemented via functions or procedures. In this lesson you learn how to develop an algorithmic decomposition of the expression tree processing app case study. You also learn how to evaluate the benefits and limitations of algorithmic decomposition. This material provides a baseline for comparison with our pattern- and object-oriented expression tree processing app presented in subsequent lessons. Object-oriented design is a method of planning a system of interacting objects to solve software problems. This design paradigm employs hierarchical data abstraction, where components are structured based on stable class/object roles and relationships, rather than functions corresponding to actions (as is the case with algorithmic decomposition). Moreover, object-oriented design associates actions with classes of objects in a manner that emphasizes high cohesion and low coupling. In many well-designed object-oriented programs, classes and objects are defined and associated in accordance with patterns and combined to form frameworks. In this lesson you learn how to develop an object-oriented design for the expression tree processing app case study. In addition, you learn how to evaluate the benefits and limitations of object-oriented design relative to the algorithmic decomposition approach presented in Lesson 3. Interpreter, which when given a language, defines a representation for its grammar. Builder, which separates the construction of a complex object from its representation. Strategy, which defines a family of algorithms, encapsulates each one, and makes them interchangeable. Visitor, which centralizes operations on an object structure so that they can vary independently. Factory Method, which provides an interface for creating an object, but leaves the choice of the concrete type to a subclass. State, which allows an object to alter its behavior when its internal state changes, making object appear to change its class. Singleton, which ensures a class only has one instance and provides a global point of access. The lesson also touches on several other Gang of Four patterns, including Abstract Factory, Adaptor, Decorator, and Observer. The pattern- and object-oriented version of the expression tree processing app case study presented in Lesson 5 provided many improvements compared with the algorithmic decomposition approach described in Lesson 3. For example, it's much more modular and extensible, its design matches the domain better, and it incurs less space overhead. The design of the expression tree process app also exhibits “high pattern density.” For instance, nearly all its classes play a role in one or more Gang of Four patterns. In addition, patterns help clarify the relationships of the many classes comprising the case study’s design. The same pattern-oriented design can be implemented readily in many popular object-oriented programming languages. For example, the Java and C++ solutions are nearly identical, modulo minor syntactic and semantic differences in these two languages. Although pattern- and object-oriented solutions are powerful, becoming a master software developer requires a balanced and nuanced understanding of the pros and cons of patterns. In this lesson, you learn how to evaluate both the benefits and limitations of patterns.